Breathtaking 14k yellow gold ruby and diamond weave design ring. This ring is just beautiful. Genuine round Rubies measure 2.5mm round each, and there are 17 of them. Accent diamonds total 1/6ct tw. You'll love this ring. 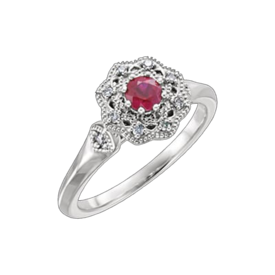 Lovely 14k white gold diamond and ruby ring. 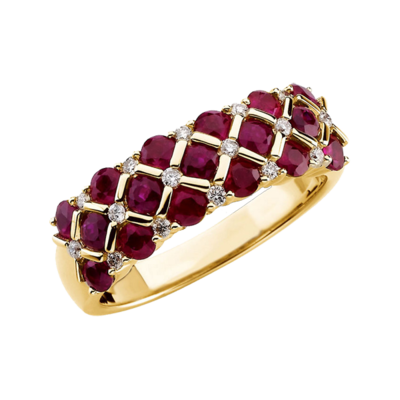 Diamonds in a circle surround the center genuine 4mm round Ruby that is A quality. Ring is a stock size 6, custom sizing available. 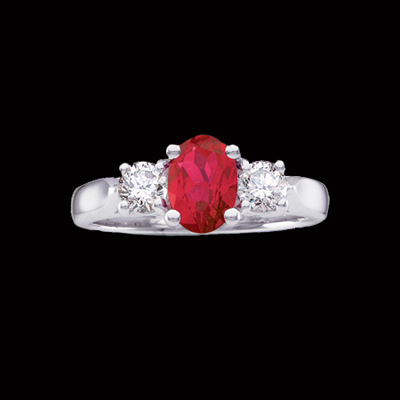 Riveting 14k white gold Ruby and diamond ring. Incredible ring features a large 7mm square cushion cut genuine Ruby weighing 1.74ct. 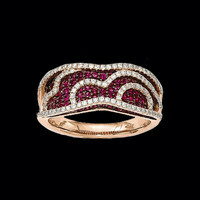 Beautiful Ruby ring is accented with .30ct tw baguette and round diamonds helping to create this gorgeous ring. We're happy to size this ring but size items are custom and non returnable. Gorgeous Platinum, Ruby, and Diamond ring. 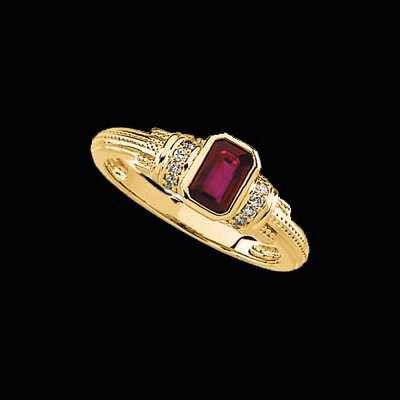 Genuine oval Ruby measures 7x5mm and sits in the center of this ring. On either side of the center Ruby sits a .20ct. Diamond total weight .40ct tw. Ruby weighs approx.. 1 ct tw. 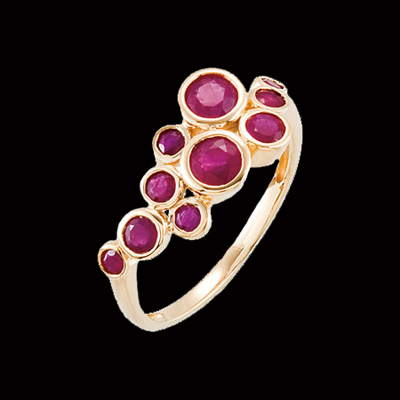 Fabulous Madagascar Ruby and Gold ring. You'll love this unique 14k yellow gold scattered Ruby design ring. Genuine gemstones range in sizes that include 2mm, 2.5mm, 3mm, and 4mm. Ruby's total 1.4ct tw. Pretty 14k Yellow gold Ruby and diamond ring. Emerald cut center Ruby measures 6x4mm and is accented on either side with diamonds totaling 1/10ct tw. 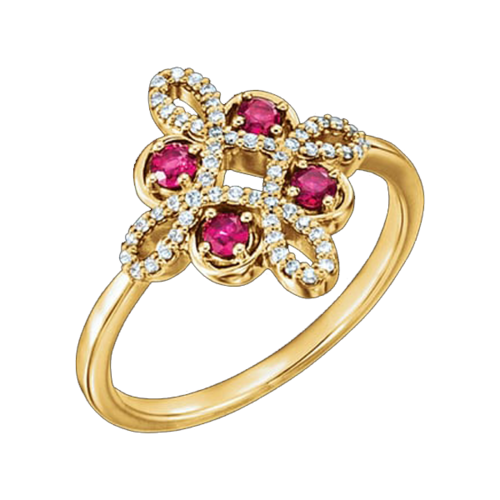 Very pretty ring. Princess Ruby and Diamond ring. 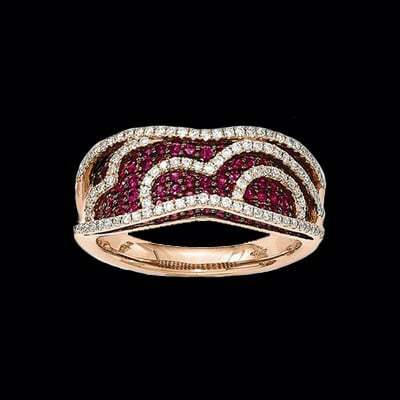 This 14k White gold ring is set with princess cut Ruby's and Diamonds to create a lovely look. Ruby's total 1.42ct tw, diamonds are SI 1 clarity G in color and total .48ct tw. Very nice ring. Stock size 6-7. We will size this ring for you but sized rings are custom and non returnable.